Mr Gaunt's collection comprises more than 200 species, sub species and hybrids of Hedychium, flowering Butterfly ginger lilies. The genus is part of the more tropical Zingiberaceae family which includes turmeric, cardamom and root ginger. However Hedychium, due to its origins, is a lot more cold tolerant than its counterparts. Many of the Hedychium have survived long periods of very cold weather, going through the winter of 2009/10 without any heat. In its native areas some of the gingers are eaten, such as H.spicatum for its stomach settling properties, or used for its anti-bacterial, anti-rheumatic and anti-inflamatory effects such as H. Coronarium. The collection is housed in a commercial glasshouse a few miles south of Chichester, West Sussex, where the gingers grown range from the very cold hardy H.Forrestii through to the epiphytic forms such as H. Horsefeldii; from the very tall H. Kong maxi through to the short H. Densiflorum; and from no scent in the flowers, through to the very strongly scented H. Chrysolecum. 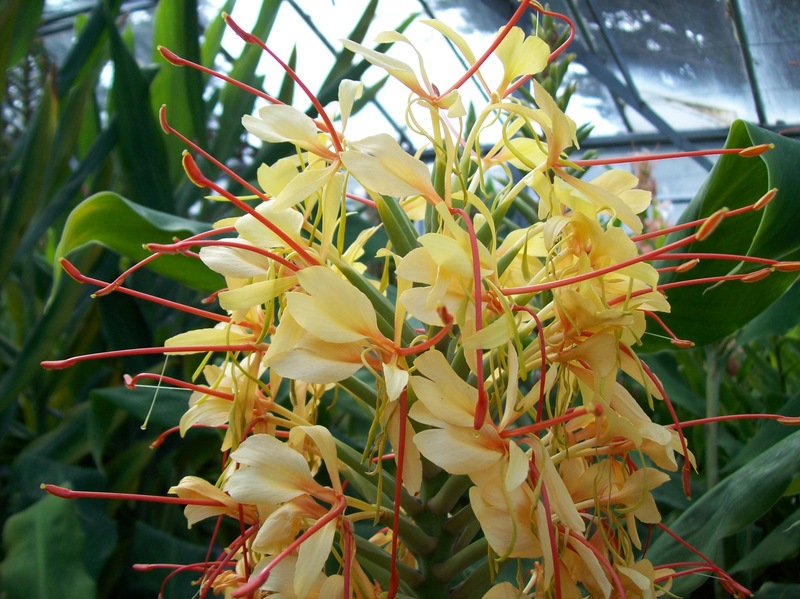 Hedychium gingers are very easy to grow, given the right conditions that they like. They are hardly affected by pests or diseases and will grow readily if the right one is grown in the right place. They should be treated like a herbaceous plant, allowing them to die back to ground level over winter, either in a border or pot. Once growth starts they should be fed and watered well through the season. The early varieties will start flowering from the longest day onwards following through to the later ones which will flower through to the first frosts. The stems will literally ‘pop off’ at ground level leaving a healed scar where the stem emerges from the rhizome. Covering with wood chips protects the rhizome from frost but allows the soil to breath so it does not rot off in the moisture. Hedychium are easily propagated by division of the rhizome but this must be done during active growth in order that the cut end has time to heal, otherwise rot will set in. Hedychium are a well worth addition to any garden, to provide that tropical look.